Windgarth House is located on the west shore of Cayuga Lake, in the heart of the Finger Lakes Wine Country, across the road from the Sheldrake Point Winery and Cafe. Only 12 miles from Taughannock Falls State Park and 20 miles from Ithaca, it is nestled in a prime location. We rent the top floor or the entirety of this beautiful lakehouse by the week during the summer (late June until Labor Day) or for shorter stays the rest of the year (2 night minimum). Windgarth House is right on the lake, with only a gently sloping lawn and beautiful gardens with mature shade trees separating the house from the lakefront. There are no stairs and no road between the house and lake, as is common elsewhere on Cayuga Lake. 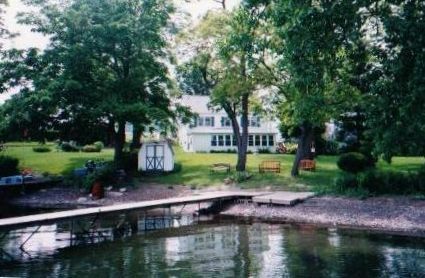 The house is located on a cove near Sheldrake Point. The water is shallow at the shore and gradually becomes deeper along the dock, to about four feet at the end of the dock. It is ideal for wading and swimming for children of all ages and adults. We provide a canoe and kayak, life jackets and other water toys for our guests' use. The area around Windgarth House is ideal for long walks along the lake and biking. There are many hiking opportunities in the area, including at Taughannock Falls State Park. If you have a smaller party, contact us for details - you can rent only the upstairs floor for a discounted rate. There is a very gently sloping lawn from the house to the lake - no stairs, no cliff. There is a swimming dock by the shore. The water starts out shallow and gradually increases to about 4 feet in depth at the end of the dock. The telephone in the house is for local calls. Please bring cell phones or calling cards for long distance calls. There is an air conditioning unit in the upstairs living/dining room, which cools the upstairs floor. The upstairs bedrooms, kitchen and downstairs kitchen/living room all have ceiling fans. The washer is located in the downstairs utility room of the house. The dryer is located in the downstairs utility room of the house. One car can be parked in the garage. (2) One in each kitchen. (2) There are two fully equipped kitchens, one on the upstairs floor and one on the downstairs floor. The upstairs kitchen has a dishwasher and microwave. We have high-speed wireless internet access at Windgarth House. Bring your laptops for access to the internet. There is a picnic table on the lawn between the house and the lake. There is a deck area near the dock right by the water. The downstairs floor of the house is accessible by wheelchair (no stairs, kitchen, living room, bedroom and bathroom all on one level). The property is clean with basic amenities. The fact that there are two kitchens was awesome for our family. Nice yard between the house and lake with a small beach for the kids. The camp is at the mid-point down Cayuga Lake and the water is good for swimming with gradual depth which is good for kids. Wifi signal is fine. There is no television if that matters to you. And the photograph, I think, doesn't really capture how close the neighbors are, although they all seemed pleasant and the neighborhood seemed quiet especially during the week. Plenty of towels, lawn chairs, extra blankets and so on. Owner is responsive. You are about 7 miles to the nearest grocery and across the road from a winery. We brought a bunch of kayaks and my little cousins enjoyed playing in the water. It was bliss to be dockside. There were so many wineries in the area, and of course Sheldrake across the way was convenient. Our family ranged from 1 ½-70 and everyone loved their stay. My hands turned purple from snagging blackberries in the backyard. My great uncle found the downstairs entrance convenient for his physical limitations. My brother didn’t like the toilet paper ply because he’s a snob, or that his phone seemed to lose charge abnormally fast, but the rest of us enjoyed the opportunity to unplug and enjoy being together. House is nice, clean and has all essentials. The grounds / lake is beautiful- only wish we had one more day to enjoy it. We have been return guests at Windgarth for over 10 years now and whenever we walk through the front door, it just feels like home. Just stroll down the gently sloping back lawn and the lake is right there as opposed to other houses in the area where the lake can only be accessed by crossing the road and going down steps. Windgarth comes with loads of water toys: a kayak, a canoe and our favorite, the adult size inflatable tubes. We also bring our own ocean kayaks and 420 sailboat to add to the fleet. There is plenty to do on rainy days as well. Ithaca is just 20 minutes away or you could choose to explore some of the other lakes as well. Watkins Glen, famous for Nascar racing, is about an hour away on Lake Seneca. And let's not forget about the wineries! There are plenty of wineries and vineyards in the area where you can have wine tastings and browse the gift shops. Just be sure to have a designated driver. If you're not into wine, there are also a few vodka distilleries close by. Windgarth is our happy place and we always feel at peace there. Having an early morning cup of coffee at the lake's shore, watching the sunrise is a blessing. You will not regret staying here. We have been staying at Windgarth for seven summers in a row now. This is a lovely spot in the beautiful Finger Lakes area. The owners are great to work with and the home is welcoming, very clean and very comfortable. The lake front is perfect for both children and adults. The family looks forward to the lake vacation every year. Our youngest family members (ages 5 to 8) frequently ask me when we get to go back to Windgarth. It is heart warming that they embrace this family time as much as the adults. I highly recommend Windgarth to anyone considering a stay here - in fact I recommended it to my sister and her family and they loved it too. Don't miss a trip (or two) to the Creamery during your stay! Windgarth is a beautiful retreat for our family. We return each summer to enjoy it's peaceful surrounds. It's located on a quiet, scenic road, so family biking is a must. It is one of a few houses in the area where the lake is in the backyard and there are no stairs to reach the water. There is a canoe, a kayak and tubes available for use at the house. The are plenty of activities in the area, if you can tear yourself away from the beauty of Lake Cayuga. Ithaca is a short drive away. The Taughannock Falls are also nearby where you can enjoy a lovely stroll to the base of the falls, or a more adventurous hike that takes you to the top. I highly recommend Windgarth House. Windgarth House is located in the heart of the Finger Lakes wine country. It is directly across the street from the Sheldrake Point Winery and close to several other Cayuga Lake and Seneca Lake wineries.